Get up to 30% off JUMBO Seafood by purchasing this voucher today! JUMBO Seafood is famous for its premium seafood at affordable prices and has always been pointed to as the number one Chilli Crab place to go for both locals and tourists. However, we must not neglect their other delectable dishes such as the Cereal Prawns, Fried Squid and Salted Egg Prawns. With various outlets in Singapore and each having a unique menu, there is no surprise that every outlet is always packed to the brim. Hence, we would recommend you Chope your place before making your way down to savour their delicious seafood. Reservation has to be done via www.chope.co before you dine at your selected restaurant. Voucher is valid for 30 days from time of purchase and good for one time use only. No extensions will be entertained. Voucher is to be presented to restaurant host upon arrival. Dining time is limited to 90 minutes for usage of time-based discount vouchers. Last order will be at 11.15pm for dinner. Vouchers are not exchangeable for cash and will not be replaced if lost or stolen. Voucher is not applicable for use during Public Holidays, Eve of Public Holidays and Special Occasions (National Day, Hari Raya Haji, Deepavali, Christmas, New Year’s, etc). Voucher is not applicable for use from 18 January 2019 – 19 February 2019. The Management reserves the rights to change the Terms & Conditions without any prior notice. All-day Vouchers cannot be used in conjunction with the Chope Off-Peak Vouchers. Off-Peak Vouchers have restricted day and time of use. All stated day and times refer to diners’ time of arrival at the restaurant, not the time of billing. A maximum of two Off-Peak Vouchers can be used per bill per dining session. 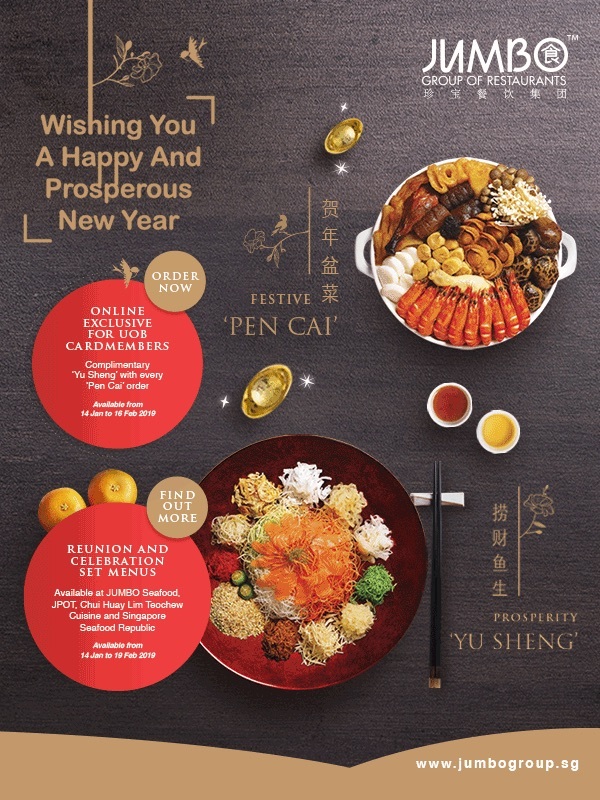 Off-Peak Vouchers cannot be used in conjunction with other promotions, discounts, offers, vouchers, Chope All-Day Vouchers or JUMBO Rewards Privileges, including the use of Great JUMBO Vouchers. The bill paid by Chope Off-Peak Vouchers will not be eligible for the earning of JUMBO Dollars (J$). Dig into these plump prawns, coated with toasted, spiced cereal for that extra crunch! This is an absolute must-try for all salted egg lovers out there! You can't get enough of these crispy and savoury goodness! One of the best-sellers, this scrumptious creation of cod fish ingots is glazed with a savoury concoction of exotic Southeast Asian Spices. I acknowledge that off peak discounted vouchers will have to be used during the specific timings that they’ve chosen. I understand specific timings mentioned on the vouchers refer to my reservation arrival day and time. I am aware of the restaurant’s last order timings (11.15pm for Dinner). I understand that only 2 vouchers can be redeemed per visit and no splitting of bills is allowed.